The New York Islanders need Rick DiPietro to be at his best if they are to make a serious push for the playoffs in the final three weeks of the regular season. The All-Star goalie looks to bounce back from his most recent loss and continue his dominant play over the Tampa Bay Lighting when the teams meet Tuesday night in Florida. In his first start after missing three games following the death of his grandmother, DiPietro made 23 saves in New York's 4-1 loss at Philadelphia on Saturday. It was the Islanders' second straight defeat and sixth in their last eight games since winning six in a row. 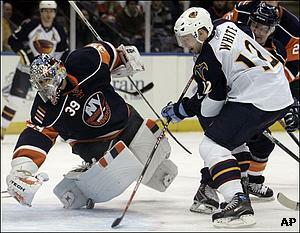 "I think once he gets his groove going he'll be alright," Islanders coach Ted Nolan told the team's official Web site. Facing Tampa Bay could help DiPietro get back on track. The Islanders are looking to sweep the season series with a fourth straight victory over the Lightning (26-35-8), owners of the East's worst record. The Islanders (32-31-7) haven't swept Tampa Bay since 2001-02. In three wins against Tampa Bay in 2007-08, DiPietro has stopped 92 of the 94 shots he's faced and recorded two of his three shutouts this season. He made 32 saves in the Islanders' 1-0 home win over Tampa Bay on Feb. 21 - the teams' most recent meeting. New York, seven points out of the final playoff spot in the Eastern Conference with 12 games remaining, will be counting on its star goalie while trying to make a desperate run for the postseason. New York has struggled offensively - having been outscored 16-7 in its last five games - and the Islanders hope DiPietro, 26-25-7 with a 2.72 goals-against average, can keep them in games if the scoring slump continues. On Saturday, though, Philadelphia did all its scoring in the final two periods to send DiPietro to his fourth loss in five starts. "Regardless how they go in, they are goals," said DiPietro, who has a 3.82 GAA in his last five contests after posting a 1.98 in winning six straight from Feb. 12-21. "I felt good. I was seeing the puck well. Some of the times it was tough to see the puck at all, but for the most part I felt good seeing it." Defenseman Freddy Meyer scored Saturday for the Islanders, who have been held to one goal in each of their last two games after a 4-3 shootout win against the New York Rangers last Tuesday. New York's Mike Comrie and Bill Guerin, two of the team's top scorers, have combined for two goals and three assists against Tampa Bay this season, but have each been held without a point in New York's last four contests overall. Tampa Bay, meanwhile, is looking to snap a five-game losing streak after a 5-3 loss at Columbus on Sunday afternoon. "I thought our team played hard," Lightning coach John Tortorella said. "We scored a couple goals and played good enough to lose." Jeff Halpern had a goal and assist, while Vincent Lecavalier scored to snap a 12-game goal drought for Tampa Bay, which has lost 10 of 11. The Lightning have been outscored 8-2 this season against New York, with former Tampa Bay forward Brad Richards, who was traded to Dallas last month, scoring both goals.